I have weird knees. I know, you’re thinking, meh, so what, everyone has weird knees. And you’re right. Knees are sort of universally weird. But mine . . . well, mine are weird in a bad way. In a fairly rare, bad way. A way that is extremely painful. For a very long time, years and years, none of the doctors I consulted had any idea how to fix my weird knees. They said the standard knee replacement wouldn’t solve my problem. In fact, an orthopedic PA told me that from time to time they’d take out my x-rays and look at them and just shake their heads. Like they couldn’t even believe I was walking around with knees that weird, in that much pain. Want to see a picture? Of course you do. WARNING: Graphic pictures of weird knees ahead. 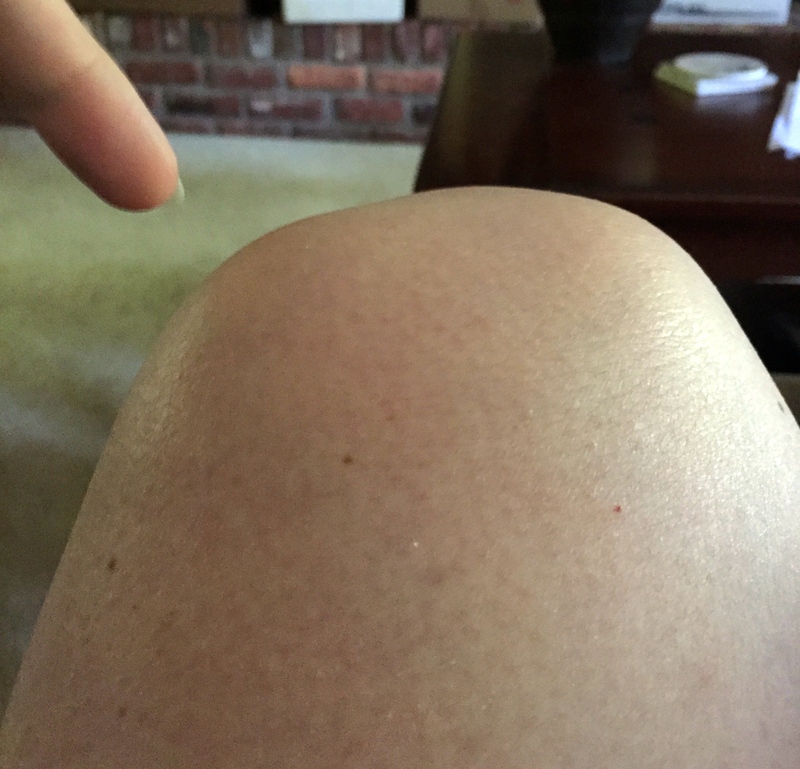 For comparison, this is a normal knee. 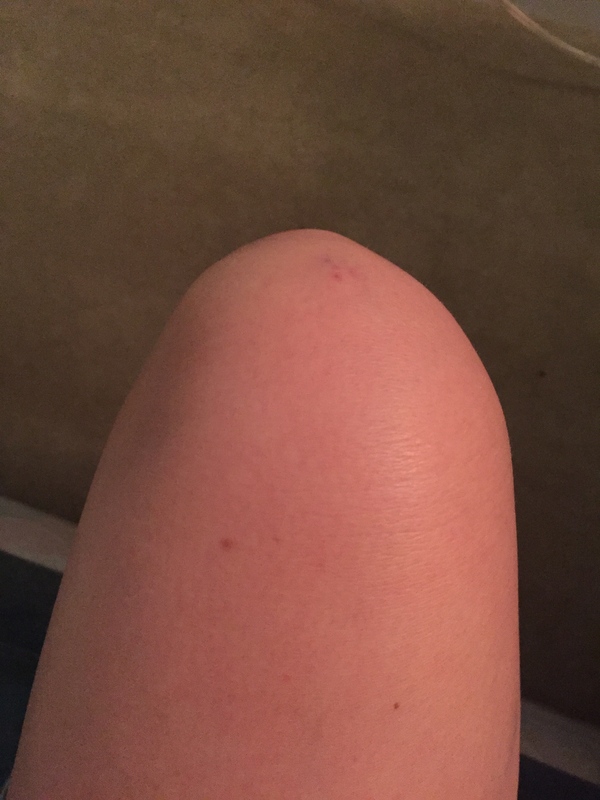 It’s actually my daughter’s knee. I got permission to post it over here. [That was an entertaining conversation: “Mom, this is weird even for you. And that’s saying something.”] See how the kneecap sits right there in the middle even when the leg is bent? Such a well behaved kneecap. This is my left knee. It’s neither normal nor well behaved. My finger is pointing at my kneecap. Really. When I bend my leg, the kneecap grinds a path over the bone and hangs out over there off the outside edge. Not occasionally. Not sometimes. Every time. It moves back when I straighten my leg. This hurts. A lot. My meniscus is long gone, a distant fond memory. This is different from dislocation, but my kneecaps have done that as well. Many times. So many I’ve lost count. At least four times each, probably more like five or six. That hurts a lot too. You do not want to see a picture of a dislocated knee. Yes, I believed all those doctors when they said there was nothing they could do, other than occasional cortisone shots. I mean, why wouldn’t I? They were doctors, good ones. Sadly, they simply had no experience with my particular problem. But I don’t want to dwell on that Dark Time, because I finally found a doctor who not only has seen weird knees like mine before, he knows how to fix them. And there was much rejoicing. This fix, of course, involves surgery. And maybe also magic. So, this week I’m having magical knee replacement surgery. On just my left knee, for now, because apparently even magic has its limits when applied to weird knees. We’ll do the other one later (sooner, if I have anything to say about it). This is what my knee will look like after surgery. Well, if you took away all the skin and tendons and blood and stuff. And, you know, if my bones were plastic. You’ll notice there is no kneecap in that model. That’s not because they remove it. It’s because the kneecap is sort of a floating thing attached to tendons and that’s not what they’re trying to show in this model. My kneecap will still be there, with a layer of that flat white stuff attached to the underside. WARNING: Graphic squicky descriptions ahead. 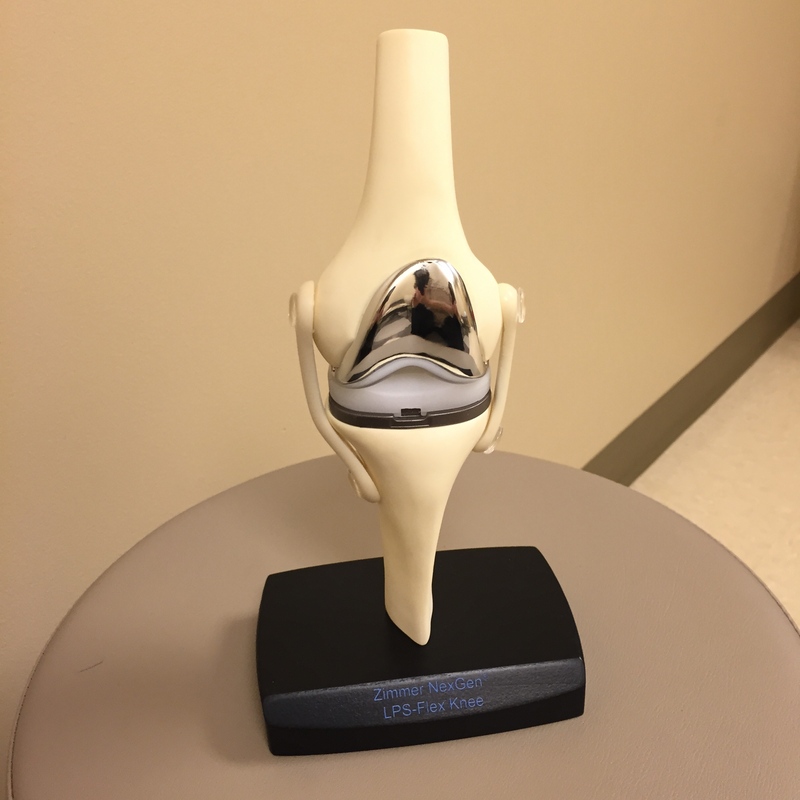 The term “knee replacement” is a bit of a misnomer. Contrary to popular belief, they do not replace the kneecap. What they do is slice off a layer of bone from the underside of the kneecap and chop off the ends of your femur and tibia (those are your big leg bones, for those who fell asleep in anatomy class). Then they attach the stuff you see in the model. Okay, so “slice” and “chop” aren’t the words they use. They call it “shaving” the bone. Probably to reduce the incidence of patient hysteria. As you might imagine, the aftermath of chopping off the ends of bones and then attaching stuff to them is painful. Or so they tell me. In fact, there have been Dire Warnings of Extreme Pain. I’m sure this is a good faith kind of thing. They want patients to be prepared for the worst, so they emphasize the pain thing. But . . . there’s pain and then there’s pain. You know that scene in the movie Crocodile Dundee? 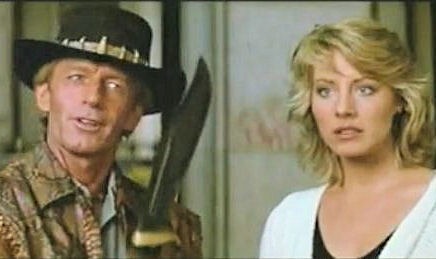 They’re walking in the city at night and a guy threatens them with a knife and Dundee says, “That’s not a knife. This is a knife.” And then he pulls out a monster Bowie knife. Yeah. That scene. It goes through my head every time someone tells me to expect “extreme pain.” I think about the sadistic monster that has been living in my knees for so very long, years and years, and suspect the doctors and I define that term differently. Maybe I’m wrong. Maybe I’ll discover that my pain has been a paltry kitchen paring knife all along. But I doubt it. Regardless, there will be narcotic pain meds involved. Two weeks of them, I’ve been told. I don’t like narcotic pain meds. I don’t like how they make me feel. This is why you won’t hear from me for a while. I mean, provided nothing goes horribly wrong, that will be the reason. I don’t have much of a filter on the crazy in my brain even while completely sober. You don’t want to know what I’m capable of in a state of spaced-out narcotic loopy-ness. Speaking of the potential for things to go horribly wrong, this past week I had my attorney draft a new Will and various other legal documents. No, I don’t think anything is going to go horribly wrong. Not to that extent, anyway. But you never know. I had intended to do this pre-op legal overhaul all along. But I was prodded by my daughter, delicate flower that she is, who threatened that if I ended up in a vegetative state and attached to life-support because I didn’t make my wishes clear about that sort of thing, she’d come stand over my hospital bed every single day, forever, and yell at me for not having my affairs in order. I suspect the hospital might have something to say about that, but she had a point. She also knows how much I’d hate being hooked up to machines indefinitely. In retaliation, I appointed her trustee of my Creative Property. She got a bit flustered until I explained that her job would basically be to say NO to anyone who wanted to do something with work of mine that wasn’t finished. Because I’d hate that. Not that I think this is going to happen either. But you never know. “I’m really good at saying NO,” she assured me. I have no idea what she’s even talking about. So I’ve done all the research and asked all the medical questions and have all my legal affairs in order. I’ve done the laundry and emptied the dishwasher and cooked and frozen enough single-serving size meals to feed the entire 82nd Airborne. I’ve even packed an overnight bag. I am SO ready. Now there’s nothing to do but wait. And write too-long over-sharing blog posts. Apparently. I hate waiting. But I’ve been waiting for a very long time, years and years. I think I can endure a couple more days. And I’ll be back before you even miss me. EDIT TO ADD: I’ll have my daughter give you all updates in the comments on this post. Provided I can convince her it’s not all that weird for her to talk to my Imaginary Friends. Not as weird as asking for a pic of her knee, anyway.